See never-before released footage of Ven. 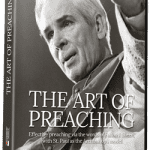 Fulton Sheen in “The Art of Preaching.” The future saint explains the secret to doing what he did best: preaching. The film also includes commentary by some of today’s best preachers. I am proud to say that I am a priest and a theologian because of the good Dominicans who formed me when I was a young man. The Dominican dedication to truthfulness, lively preaching, fellowship have inspired me throughout my life. Dominicans continue to be an indispensable leaven in our culture. George Weigel, Distinguished Senior Fellow, Ethics and Public Policy Center.